Working with Crystal Marie events was nothing short of amazing!! She is very professional, knowledgeable and creative. Always available for ideas and/or concerns. I highly recommend anyone considering having a event to select her. It will be An experience to remember!!! 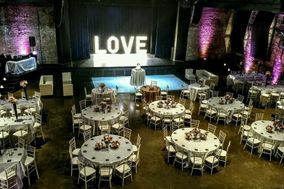 Crystal Marie Events is awesome and amazing. I am a travel agent and I have worked with Crystal on a couple of destination weddings in the past 2 years, as well as with one of her clients on a honeymoon. Crystal is thorough, responsive, detail oriented, full of energy, knowledgable and displays professionalism and service excellence at every turn. Not only is she a great partner to work with, I see that she goes above and beyond to make sure her clients' wedding planning and experience is everything they dream it to be. She is a joy to work with and I have no problem recommending Crystal Marie Events to brides to be in the Detroit area, as well as nationwide! She is amazing at what she does! I am having a destination wedding and I did not want a run of the mill wedding dress. Upon speaking with Crystal and telling her what I wanted, she helped me find a wonderful seamtress/designer that executed my dress just like I wanted. Crystal was always there when I needed a few pointers for wedding tips/advice. She is definitely someone you would like to have in your corner when it comes to the stress of planning/executing a wedding! From beginning to end everything was awesome and myself and the bride was extremely happy and can't wait till we use her services again. Thanks so much Crystal Marie!!!! Crystal is amazing!! She handled all of our destination wedding plans while I was overseas for work. She responded to all calls and emails in a timely manner, had great attention to detail and most important to me she was a good steward of our funds. She kept us on budget but she didn’t cut any corners. She worked closely with the travel agent and ensured our guest were taken care of. I was impressed with her work, customer service and ability to provide quality and style at an affordable price. I would definitely recommend her. OMG...What can I say about Crystal Marie. She is the BOMB!!! She is very professional and very organized. Any time I need to talk to her, she was there. If I needed help finding different vendors for things,she was johnny on the spot. She makes sure the bride and groom are not stress when planning your big day. She makes sure you get whatever you want to make your day as special as possible. Our families even loved how professional she was in taking care of us and them. She also made sure that whatever vendors you hire for your big day are on their job as well and if NOT she will let them know (LOL). 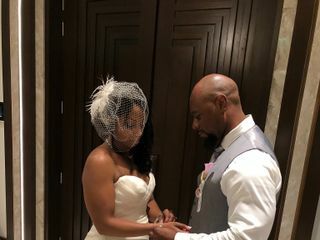 Another thing I can say about Crystal and her team is that if you have a vision for your big day, they made sure they brought it to light and that is EXACTLY what they did for me and my new husband. Crystal and her team went over and beyond to make sure we stayed smiling the whole time and we had a GREAT time. MONEY WELL SPENT!! So if your a bride looking to hire a planner, Crystal is your girl! She will be with you every step of the way and WON'T let you down!! My husband even said " If we were to get married or celebrate every year, she will be our planner." Thank you so much Crystal it was the BEST DAY EVER!!! On point!!! Involved with every detail from beginning to the end. You can call on her very any and everything. She made my day an extravaganza!!!! Everything was timed perfectly! I had no worries and no regrets!!! Best Event Planner hands down!!!! No need for any other! As a Entertainment Company, The Todd Everett Experience works with a variety of event planners. With that being said, it's not always a smooth situation. Working with Crystal Marie Events has been a pleasure! Crystal is very easy to communicate with, always on top of everything and she puts the interest of her clients before everything. She makes the process so easy and makes it very enjoyable to work with an event planner. Every wedding that we have done with her has been a success! One thing that you typically see when putting an event together is the stress build up. Crystal is always smiling and keeps a "yes" before "no type of attitude. We hope to work with her again in the near future! Crystal is amazing. I loved working with her for our wedding. We had a smaller wedding (76 people), but she did such a great job taking care of the littlest details. Great personality, professional and you can tell she truly enjoys what she does. Thanks Crystal for making our special day spectacular. Using Crystal was one of the best decisions I made for my wedding. I told her what we were looking for in a venue and she found us the perfect location. She also has a lot of experience so she is very familiar with several vendors and pricing for things in general. She was always prompt in responding to questions and kept me on timeline so that I wasn't scrambling to do things at the last minute. You know you have a great planner when there is a major issue with the seating chart and all you do is move 3 people, and somehow she makes it work! I still can't figure out how she works her magic, but that's what she's for. Crystal Marie was extremely helpful and professional throughout my entire wedding process. She was able to help me create the wedding of my dreams, and kept me calm while doing so! If afforded the opportunity to hire a wedding planner, I hihgy recommmed doing so. Crystal Marie is a class act and I would refer her services to any upcoming bride! Crystal was amazing. I needed her assistance to set up the decor for my wedding and she executed everything perfectly. It's like she was reading my mind telepathically. I now regret not hiring her to do my entire wedding because she went above and beyond the call of duty. She helped me in troubleshooting the days and weeks leading up to my wedding and was an excellent site manager the day of. I strongly recommend her for any event you are planning! Hiring Crystal Marie Events LLC was the best thing I could have done for my special day. She has so much knowledge. Creative is an understatement!!! The day of my wedding I didn't have to do anything but show up ready to walk down the isle. My whole planning process was stress and worry free and I have Crystal Marie Events LLC to thank for that!!!! THE BEST!!! My husband and I had the pleasure of working with Crystal Marie Events LLC for our wedding. I gave her our vision and she made it come to life way beyond my imagination!!! She helped us find the perfect venue, photographers, videographer, cake company, and florist. She is very prompt, detailed, and make you feel like royalty! Our wedding day ran so smoothly! I recommend any bride to put your trust in her and your wedding day will go down in history! She told me it would be EPIC and it was!!! Our wedding guest told us it was just like a fairytale! God bless you Crystal Marie! I'm so happy we found you! When my husband proposed to me I knew exactly who to call, Crystal Marie Events LLC. I've always heard and even saw how stressful the wedding day could be and I did not want that for my day. I wanted easy going and wanted the day to be as special as possible. And Crystal Marie Events, LLC made that POSSIBLE! My husband and I didnot have to worry about the decor setup and break down, we did not have to worry about who walked when and when to walk during the ceremony. 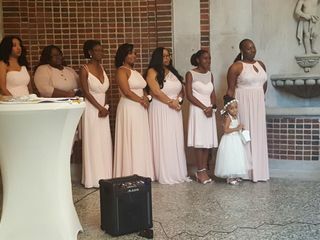 Not only did Crystal Marie Events, LLC take away the burden of the wedding day planning but she also turned my vision into a reality and that was priceless! We were so blessed to work with such a talented, elegant and professional woman of business! A planner will definitely either make or break your event and in my eyes you NEED ONE! Hire a Planner! Crystal Marie Events, LLC! My husband and I requested Crystal's services for our destination wedding in Cozumel. We were a bit nervous about the idea of organizing our special day via e-mail and not at the resort, so we requested Crystal's services to develop a "day-of" schedule. Crystal was so helpful. We had a consultation about all of the details and I knew everything would be alright! She also gave us the idea to do a wine ceremony during the wedding (instead of a unity candle or sand ceremony) and we couldn't have been happier. It was perfect. And, to top things off, Crystal went above and beyond expectations by providing our guests with special "Do Not Disturb" signs to hang on the doors the day after our wedding events. Crystal is not only a beautiful person, but she is an expert at what she does. I would recommend everyone to enlist Crystal Marie Events LLC for your wedding or special event, wherever you are in the world!